The German Shorthaired Pointer is a breed that needs both mental and physical stimulation. As a natural hunter, it needs daily physical activity to prevent it from acting as a nuisance inside of the home. Within the home and around the family, the German Shorthaired Pointer is a loyal and devoted companion, but can sometimes be overly excited when around children. Due to its hunting instincts, caution must be taken around other small pets or animals, but this mannerism can be maintained through gentle training. The earlier you begin the training to curb the pup’s aggression while they are young, the less aggressive they are as full grown dogs. The German Shorthaired Pointer may have the occasion to whine or bark often. As a natural hunting dog, the German Shorthaired Pointer needs a reasonable amount of physical activity. The best form of exercise for it is a hunting, hiking, swimming, or active play session where the dog is being both physically and mentally stimulated. Swimming is a favorite pastime of the German Shorthaired Pointer and it will dive into water at any chance that it gets. The energetic breed can have these needs satisfied with about an hour of any of these physical activities each day. The German Shorthaired Pointer is capable of outdoor living in mild environments, but is better suited in a home environment with access to the outdoors and a yard as well. Maintenance of the coat is minimal, with the only occasional brushing needed. 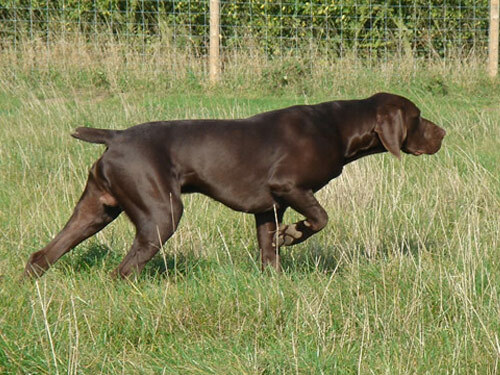 The major health concern for the German Shorthaired Pointer is lymphedema, which involves fluid in the lymph nodes. There are several minor health concerns which include Canine Hip Dysplasia (CHD), entropion, gastric torsion, von Willebrand’s Disease (vWD), pannus, Obsessive Compulsive Disorder (OCD), and hypothyroidism. Occasionally seen in the German Shorthaired Pointer is ectropion, Progressive Retinal Atrophy (PRA), and cardiomyopathy. It is suggested that to keep the breed healthy regular testing of the hips, eyes, vWD, cardiac, and thyroid is necessary. The average life span of a healthy German Shorthaired Pointer is 12 to 14 years. The German Shorthaired Pointer gained many of its natural attributes and skills from early breeding practices during the seventeenth century. These abilities included mostly hunting instincts, such as pointing, retrieving, trailing, and game-killing abilities. Original crosses between the Spanish Pointer and Hannover Hound developed a dog that could trail and point both birds and mammals. In an effort to develop an all purpose hunting dog, the English Pointer was crossed into the breeding but not without controversy due to their dislike of being in water. Additional breeding eventually weeded out the unwanted pointer traits. The modern Shorthaired’s foundation was thought to have come from their descendents the Deutsch Kurzhaars, which originally distinguished themselves at the German Derby. The German Shorthaired Pointer became recognized in Germany in the late 1800s, arrived in America in the 1920s, and became officially recognized by the AKC in 1930. The German Shorthaired Pointer remains popular today for hunters that are looking for a versatile hunting dog with all characteristics in one dog, as well as an compliant companion in the home environment.